1) This paper was presented at the FIG Working Week 2017 in Helsinki, Finland, 29 May – 2 June. This paper describes general properties and characteristics of different types of UAVs. Results showed that UAV photogrammetry provides low cost tool for producing topographic data in urban areas, especially when small areas are of concern. The National Land Survey of Finland (NLS) is currently working towards a new joint National Topographic Database (NTDB). Large scale municipality level urban 3D topographic data will have a great role in the forthcoming NTDB. Potential of future topographic data production methods, such as using unmanned aerial vehicles (UAV), to reduce manual labor in the field and provide more cost-efficient map updating in urban areas needs to be investigated. This paper describes general properties and characteristics of different types of UAVs, such as multirotors and fixed-wings and presents a typical UAV system for mapping application including its payload. Operating UAVs in populated urban areas requires proper planning and work guidelines in order to produce accurate and reliable data and simultaneously operating safely and taking into account the local legislation regarding unmanned aviation. The preliminary process flow for a UAV-based mapping which takes into account these issues will be presented. The process starts from the measurement planning and end up to 3D vectorized topographic data. The paper presents results of a test case were the described workflow has been used to produce 3D topographic data of urban area using UAV imagery and photogrammetry. Results showed that UAV photogrammetry provides low cost tool for producing topographic data in urban areas, especially when small areas are of concern. The National Land Survey of Finland (NLS) is currently working towards a new joint National Topographic Database (NTDB). The NTDB will provide basic information about physical environment including objects such as buildings, roads, waters, elevation, land cover and place names. The data will be based on the current NLS Finland Topographic Database, orthoimages, laser scanning data, digital elevation models and on large scale planning data from municipalities. As large scale data from municipalities will have a great role in the forthcoming NTDB, a project has been started to investigate the current and future topographic data production methods in Finnish municipalities in urban areas. The project investigates what are the current topographic data production processes and could new mapping methods, such as using unmanned aerial vehicles (UAV) or terrestrial mobile mapping technologies, reduce manual labor in the field and provide more cost-efficient map updating in urban areas. The project investigates the usability of these methods and prepares a preliminary process model and guidelines for using these methods in municipality level 3D topographic data production. Furthermore, the project includes several case studies in producing 3D topographic data in different municipalities using UAVs. This paper focuses on describing the UAV part of the project. General properties and characteristics of different types of UAVs, such as multirotors and fixed-wings will be described and a typical UAV system for mapping application including its payload will be presented. Usability of UAVs in mapping objects for municipality level topographic database in urban areas and applicability of UAV-based mapping in different situations will be evaluated. Operating UAVs in populated urban areas requires proper planning and work guidelines in order to produce accurate and reliable data and simultaneously operating safely and taking into account the local legislation regarding unmanned aviation. The preliminary process flow for a UAV-based mapping which takes into account these issues will be presented. The process starts from the measurement planning and end ups to 3D vectorized topographic data. This process is divided to three phases which are the planning phase, measurement phase and data processing phase. These phases are described in more detail in this paper. A basic UAV-system consists of the aircraft, pilot with a remote control and ground control station. Typical sub-systems on-board a UAV are an autopilot, a global navigation satellite system (GNSS) receive, inertial measurement unit (IMU), power supply and transmitter for telemetry information. UAV systems usually also include flight planning software. UAVs vary in size and operation principles. Two of the most used UAV types are fixed-wings and rotary wings (e.g. multirotors and helicopters). Fixed-wing UAVs operate using the lift caused by the forward airspeed and aerodynamical rigid wing attached to the UAV. The forward speed is usually created using propellers. The required forward speed for take-off can be achieved using a runway or a launcher. The fixed-wings require more landing space compared to rotary wings that can be challenge in tight spaces in urban areas. Rotary wings use multiple rotors whose rotation axis points upwards. The horizontal motion is achieved by varying the relative speeds of the rotors. Constant airflow and forward motion is not required and thus rotary wings can take-off and land vertically. This is one of their notable benefit, especially in urban environments were there might not be proper takeoff areas. The flight velocity of fixed-wings is usually higher than with multirotors and thus can provide more areal coverage. However, they are at the same time unable to move as slow as rotary wings or move vertically which are sometimes beneficial features in urban aerial imaging. The usual payload for UAV in urban mapping application is a good RGB compact or DSLR (digital single-lens reflex) camera. The geometrical and radiometrical quality and accuracy of the end-products is directly related to the geometric and radiometric properties of the camera system. Small laser scanners are also becoming available for UAVs and their use in the future will increase. Previously, the weight of the laser scanner has limited their use in UAVs, especially in urban areas which have more strict weight limits. More specialized cameras, such as multi- or hyperspectral cameras or thermal cameras are also becoming more common in UAVs due to sensor development. The two basic imaging configurations for mapping purposes are nadir and oblique imaging. The nadir imaging mode provides the view which corresponds to the traditional manned aircraft aerial imaging mode providing the imagery for orthoimage creation of the area of interest. Oblique imaging is beneficial when the facets of buildings are of importance, for example, when textures for 3D city model are of interest. Imaging configuration can also be modified with different kinds of flight patterns. The RPAS operation can be either based on visual-line-of-sight (VLOS) or beyond-visual-line-of-sight (BVLOS). - Planning phase: General planning and measurement method decision based on the mapped area and required accuracies; Legislative preparations; Risk management; and Flight planning. - Measurement phase: Ground Control generation; and Aerial imaging. - Data processing and mapping phase: Aerial image processing to orthomosaics and 3D point cloud data; Accuracy evaluation; and Vectorization of 3D data to topographic data format or other map-updating tasks. These phases and their sub-tasks are described in detail in the following sections. If UAV-based aerial imaging is chosen as the mapping method, necessary preparations demanded by the local legislation and regulations, has to be taken into account. All the possible restriction applying to the area of interest needs to be investigated and considered. For example, current Finnish regulations on UAV operation (Trafi, 2016) demand that proper safety and risk assessment has to be done when operating at densely populated areas. All the possible risks have to be identified and possible methods to eliminate or minimize the risks have to be determined. In addition, the UAV operator’s organization has to have up-to-date UAV operations manual which includes procedures guidelines in normal operation and in case of problems. The flight planning should be conducted in such a way that the operation is safe and the objectives in data accuracy and reliability can be achieved throughout the area of interest. Multiple flights have to be planned if the AOI cannot be covered properly with one flight. The timing of the flights is also important. The elevation angle of the sun above the horizon is usually preferred to be as large as possible in order to minimize the size and amount of shadows in the imagery. 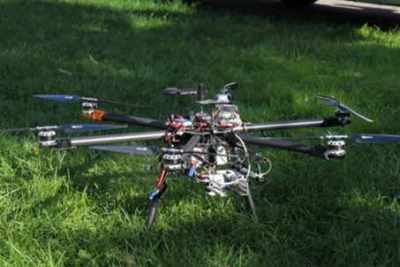 UAV operation is also highly depended on the weather conditions and the UAV system used. Some UAVs are more stable in windy conditions than others and UAV operation during rain is hardly ever desirable. Thus, weather forecasts should be followed when the planned flight day is approaching and changes to the plans made if required. The used camera system and flight altitude is chosen based on the wanted ground sampling distance (GSD). Overlaps of adjacent images affect the quality and accuracy of the orthomosaics and photogrammetric point clouds, and thus the planned flights should provide proper side and forward overlaps. The forward overlap is determined by the camera field of view (FOV), imaging interval and flight velocity. The side overlaps are determined by the camera FOV and spacing of the adjacent flight paths. Take-off location should planned so that pilot can see the UAV during the entire flight and pilot’s field of view covers as much of the surrounding airspace as possible. Ground control points (GCPs) are used to georeference the imagery to a real world coordinate system. The GCPs can also be used to evaluate the resulting geometric accuracy of the end-products. The GCPs should be distributed evenly to the AOI. If the AOI is imaged with several flights, some of the GCPs should be placed so that they are imaged from different flights. Enough GCPs should be placed on the AOI to enable required accuracy for georeferencing. The amount of GCPs needed is also affected by the accuracy of the on-board navigation system. In addition to the GCPs, additional check points can be planned to the AOI. These check points are only used to evaluate the accuracy of the processed data. The positons of the GCPs and check points should be planned as well as possible but the final decision of the exact position is done in the field, since the visibility of the GCP targets can be determined most reliably in situ. GCPs can be natural targets, such as road markings, or special geometric tags. The locations of the GCPs and check points are placed on the AOI as planned and they are measured using proper accurate terrestrial measurements system, such as an accurate GNSS receiver or a total station. The georeferenced accuracy of the end products can be only as good as the ground reference measurements. The location of the take-off place should be chosen so that a safe take-off and landing can be performed. In addition, the take-off spot should allow the pilot to move freely and see the UAV during whole flight. Assistance for observing the surrounding airspace can be provided by other personnel. If the weather conditions permit and nothing is preventing safe operation, the flights should be performed as planned. The functioning and behavior of the UAV should be monitored visually and by monitoring the telemetry data received from the UAV. If severe problems are encountered, the flight should be aborted as the user’s UAV operations manual states. After the flights have been successfully performed and the UAV has been safely landed, the image data should be briefly checked in order to be sure that the camera was functioning properly and images are visually acceptable in sharpness and contrast (i.e. geometrically and radiometrically). The photogrammetric software for producing topographic data should have reporting capabilities that will output accuracy evaluation based on the internal and external camera calibration parameters and GCPs. The number of commercial software that can automatically produce topographic data in vector format from point cloud data has been quite limited. However, the increased usage of laser scanners and photogrammetric methods to produce 3D data has promoted the development also in the software side. However, automatic methods for point cloud vectorization currently mostly limited to buildings which are of the top interest in urban areas. The amount of automated procedures for vectorization of other types of targets than buildings, are surely increasing in the future. Vihti municipality did not have and urgent update need for any of their urban areas since their topographic data was well up-to-date on the urban areas. However, the Nummela center area in Vihti did have needs for future planning and we chose it as our AOI ( Figure 1). 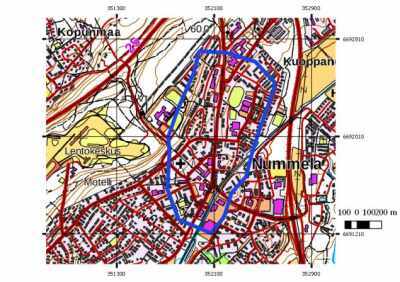 According to the Finnish UAV regulations, Nummela center is a densely populated area which requires extra caution and risk assessments for measurement planning. As the area is densely populated the operation had to be based on visual line of sight (VLOS), and detailed risk assessment report had to be produced. There was also a small airfield west from Nummela center which is mainly used by hobbyists and private persons. The airfield does not have own continuous air traffic control or official control zone (CTR) zone. However, communication between the airfield operators was required and a notice to airmen (NOTAM) was created for the duration of our measurements. Figure 1 Project Area of interest (AOI): Nummela center in Vihti municipality in southern Finland. The flight planning was done using open source software MissionPlanner (ArduPilot Development Team). The area of interest was approximately 49 ha. In order, to cover the study area safely and using VLOS operation, we planned three flights to cover the AOI. The planned flights are presented in Figure 2. The flight durations were kept under 20 minutes. The planned flight altitude was 140 m which would provide approximately 3 cm GSD. The flight speed was set to 5 m/s which provided 90% forward overlap. The flight pattern and the camera used provided 70% side overlap. Figure 2 Planned UAV flights to the area of interest. The UAV system was a hexacopter with Tarot 960 foldable frame and the following specifications ( Figure 3). The autopilot was a 3DR Pixhawk with Arducopter 3.15 firmware. The payload capacity is 4 kg and the system has a 15-30 min flight time depending on payload. The UAV trajectory was collected with on-board GPS (RasPiGNSS, NV08C-CSM) and the used IMU was VectorNav VN-200. The imagery was collected with Samsung NX500 RGB camera. Figure 3 UAV system used for aerial imaging. The UAV imaging was performed on September 2017 on full sunny day. All flights were conducted on the same day. First flight was flown around 1 pm and the last one at 5pm. The take-off areas were chosen so that the UAV was clearly visible to the pilot during the flights. During the flights, we had two other persons observing all direction of the surrounding airspace in order to detect possible other aerial vehicles. The total number of images captured with the three flights was 1334. The initial inspection of the imagery indicated that the camera settings had been good and although shadows were present, the objects in the shadows were clearly visible. Altogether, 10 GCPs were placed evenly distributed in the study area and measured using Trimble R10 VRS-RTK- GNSS system. The image data was processed using Pix4D software (Pix4D, Lausanne, Switzerland). Orthomosaics, DSM and photogrammetric RGB point clods were and mesh was created. The GSD of the processed data was 2.93 cm. The GCP root-mean-square-errors (RMSE) were 0.0021 m, 0.0014 m and 0.0015 m for X-, Y- and Z-coordinates, respectively. The produced point cloud had point density of approximately 1000 points / m2 . Overview of the entire produced orthomosaic and DSM for the study area is presented in Figure 4 and an example of produced photogrammetric RGB point cloud and mesh is shown in Figure 5. Figure 4 Orthomosaic and DSM of the area of interest derived from UAV imagery. Figure 5 Mesh (top) and RGB point cloud (bottom) of the area of interest. Preliminary building vectorization of the data has been concentrated on building vectorization. The vectorization has been done using TerraScan software (Terrasolid Ltd., Helsinki) which provides good automated methods for building vectorization. 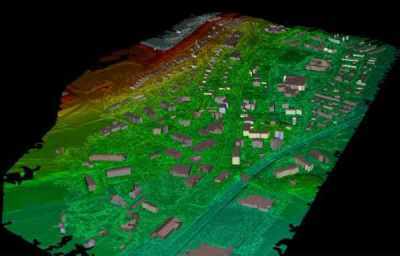 The methods have been originally developed for airborne laser scanning (ALS) data but they work also with photogrammetric point clouds. The main steps in building vectorization include classification of points to ground, vegetation and building points, smoothing of data and building facet detection from the building points. The resulting vectorized building can be exported in CityGML format. Vectorization of other targets present in urban topographic data such as roads, paths, tree lines, fences has not yet been conducted. Preliminary results of automated building vectorization is presented in Figure 6. Figure 6 Automatic building vectorization performed with TerraScan software using the photogrammetric RGB point cloud data derived from UAV imagery. 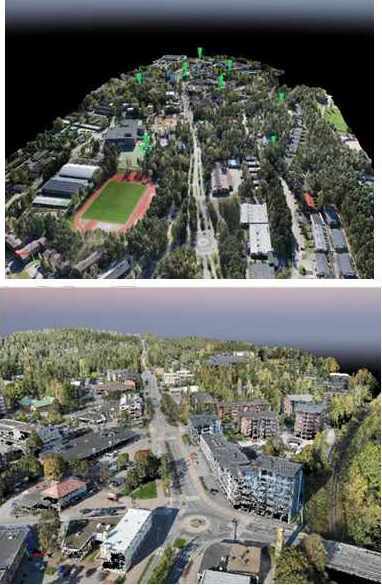 This paper investigated the potential of using unmanned aerial vehicles (UAV) to produce reliable and accurate 3D topographic data in urban areas. The paper described general properties and characteristics of different types of UAVs and presented a typical UAV system for mapping application including its payload. Workflow for producing accurate and reliable 3D topographic data safely and taking into account the local legislation was presented. The paper presented results of a test case were the described workflow had been used to produce 3D topographic data of urban area using UAV imagery and photogrammetry. 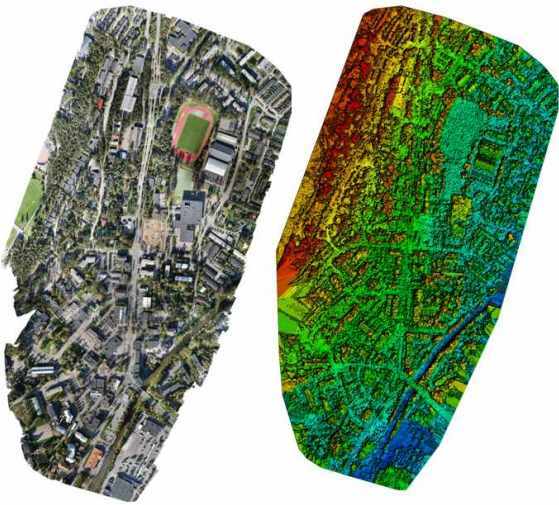 Results showed that UAV photogrammetry provides low cost tool for producing 3D topographic data in urban areas, especially when small areas are of concern. The utilization of UAVs in Finnish municipalities in topographic data production is likely to increase notably in the future. Mr. Olli Nevalainen is a Research scientist at the Finnish Geospatial Research Institute in the National Land Survey of Finland and a D.Sc. student in the Aalto University School of Engineering. He received his B.Sc. and M.Sc. degrees in remote sensing and photogrammetry from the Aalto University in 2011 and 2012, respectively. His current research include development of various remote sensing methods, such as laser scanning and satellite- and UAV-based remote sensing, and their applications in environmental research and mapping. Teemu Hakala, works as a research scientist for the Finnish Geospatial Research Institute, Department of Remote Sensing and Photogrammetry. His research interests include UAV sensor technology, radiometric measurements, hyperspectral environment monitoring, hyperspectral LiDAR and radar technology. Dr Eija Honkavaara is a Research Manager at Finnish Geospatial Research institute and leader of the DroneFinland research center. Her current research focuses photogrammetry and hyperspectral remote sesnsing using drones. Roope Näsi received the M.Sc. degree in technology in electronics from Helsinki University of Technology, Espoo, Finland, in 2014. He is currently working toward the Ph.D. degree with Aalto University, Espoo. He is a Research Scientist with the Department of Remote Sensing and Photogrammetry, Finnish Geospatial Research Institute, Masala, Finland. His research interests include photogrammetry, unmanned aerial vehicles, radiometric calibration, and hyperspectral environmental monitoring applications.